WARNING: This product can expose you to chemicals including 1,3-Butadiene, which is known to the State of California to cause cancer, and to cause birth defects or other reproductive harm. For more information go to www.P65Warnings.ca.gov. The Expanded Orchestral light stand puts more LED lights where you need it. The use of 10 LEDs allows you to expand the width of coverage. 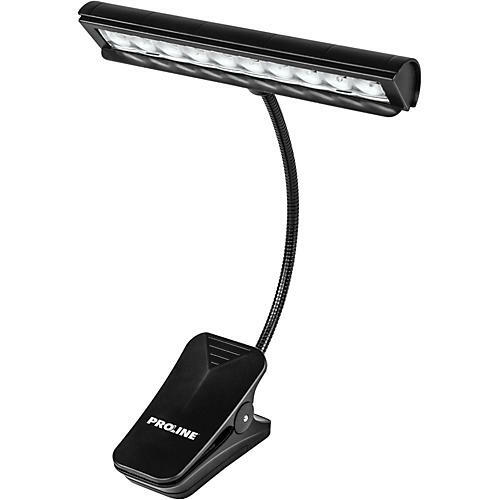 Adjustable 2-step light intensity helps you adjust to changing lighting conditions. Powered by 3 AA batteries, you will get up to 18 hours of service. There's also a power supply included so you can plug it in when using in more permanent situations or at home. The 11 flexible gooseneck allows you to keep the light covering any size music book.